The most notable new feature in the ONE 140 and 140S units is the inclusion of TomTom’s Advanced Lane Guidance feature. Though GPS systems are terrific at guiding you down the highway, when it comes time to exit, it’s not always clear what lane you should be in. The TomTom’s Advanced Lane Guidance feature clearly shows you what lane you should be in for upcoming turns. Also notable is the inclusion of maps for all of North America, including Canada and now, Mexico. Coverage of Mexico is not yet complete, but for those considering road travel there, the inclusion of this map set represents a significant value. Like its predecessors, the ONE 140 and 140S include its clever EasyPort™ windshield mounting system. The mount is integrated into the unit — simply fold it out and it attaches easily and securely to the windshield. When folded into the unit, which is slimmer than prior ONE models, the GPS remains quite portable. Though the mount adds some bulk, the unit still easily fits into a purse, briefcase, or even a pocket. The mount addresses the problem of leaving the mount attached to the windshield, potentially attracting the attention of thieves. With the TomTom ONE 140 and140S, you take the GPS and its mount with you. For air travelers, it’s one less thing to worry about packing. The ONE 140 and 140S include automatic day/night display modes, optional automatically-adjusting speaker volume depending on background volume. TomTom’s route preview feature displays an overall view of your route and allows you to select alternatives.TomTom’s “Help me!” safety feature allows you to find the location of the nearest hospital, police station, vet, dentist, pharmacy, etc. at the push of a button. The unit will also guide you if you want to “Drive to Help” or “Walk to Help.” Press “Where am I” and the unit will indicate your current position. TomTom has thoughtfully also included an electronic first aid guide as part of it’s “Help me!” feature. TomTom’s “Map Share” feature allows you to make corrections and additions to your maps (e.g., blocked roads, updated information for points of interest, new streets or points of interest, etc.). You can make changes right on your portable GPS device and later upload and share them with other users using the TomTom HOME desktop companion software on your computer. There is no charge for this feature. Yet another example of TomTom’s clever innovativeness. The ONE 140 and 140S are capable of real-time traffic monitoring and avoidance, but require the additional purchase of an RDS-TMC Traffic Receiver and a subscription to the over-the-air traffic service. The ONE 140 and 140S lack hands-free mobile phone capability, MP3 player, audiobook player, photo viewer, remote control, etc. 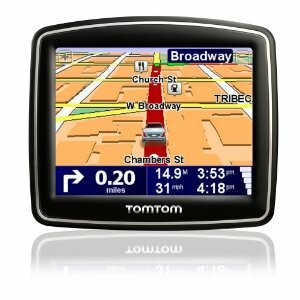 If any of these are important to you you’ll want to consider TomTom’s higher-end offerings or consider the top-rated Garmin nuvi 7×5 series, a Rated4Stars Top Pick .